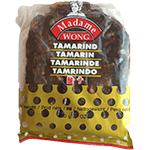 Sweet and tangy tamarind is one of the widely used condiment spices found in every South Asian kitchen! The tree is very large with long heavy drooping branches and dense foliage. Full grown-up tree might reach up to 80 feet in height. During each season, the tree bears irregularly curved pods in abundance all along its branches. Each pod has thick outer shell encasing deep brown color sticky pulp enveloping 2-10 hard dark-brown color seeds.